High Stakes Poker: Any Questions? By all accounts, the WPT Doyle Brunson Five Diamond World Poker Classic final table was going to be a good one with a line-up that included Corkins, Sung, Rheem, and Filippi. But most eyes were on Rheem, who was one of the November Nine favorites but had to settle for a seventh place finish at the 2008 WSOP final table. Rheem was determined going into the WPT final table, even knowing that two of his opponents – Steve Sung and Amnon Filippi – were close friends. But as players dropped out of sight, Rheem was able to go heads-up against Justin Young in what ended up being a five-hour epic heads-up match. The chip lead was exchanged numerous times, but it may have been sheer determination and fan support that led Rheem to finally capture the title at 2am. 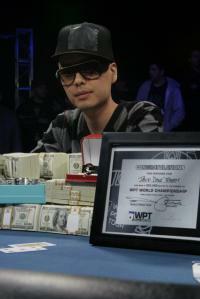 He won the World Poker Tour title and the $1,538,730 that came with it. I would point you to the official WPT live updates, but it has been unavailable on the internets all morning. So, for updates as they happened throughout the final table, check out Martin’s reporting at PokerListings. $1.5 million following $1.7 million. Damn, pretty good. Anyone else come close to putting together something like that — either this year or ever?